I don't have very many ancestors to research in my home county of Calhoun, in Michigan, but Warren Fenn is one. 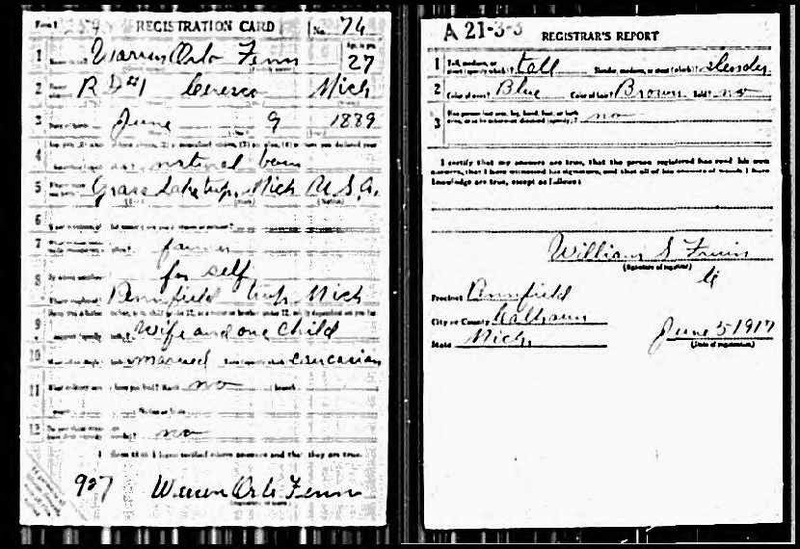 Source: "World War I Draft Registration Cards, 1917-1918," [database on-line], Ancestry.com (www.ancestry.com : accessed 21 June 2014), entry for Warren Orlo Fenn; United States, Selective Service System. World War I Selective Service System Draft Registration Cards, 1917-1918. Washington, D.C.: National Archives and Records Administration. M1509, 4,582 rolls. Imaged from Family History Library microfilm. Where in the World is Daniel Fenn?